Summertime, and the living is… not as easy as Mina had hoped. But, she finally has a full-time job, working alongside her new boyfriend, Jack (that is, Chef Jacque, when they’re at Squirrel Run Acres.) That’s good, right? Except that poor Mina and Jack have been working together a lot lately–specifically fourteen hour shifts in a sizzling kitchen–for months. When tempers flare hotter than fat on a fire, Jack steps up and splurges for a romantic get-away to Cape May Point, New Jersey. All is forgiven and soon sunset beaches wink from the distance, until Mina’s stuck with dog sitting duties for Jim, her buddy Bauser’s three-legged dog. Complicating the canine conundrum is Bauser’s last minute plea to deliver Jim to a client location, in Bumville, New Jersey. No biggie, except that Bumville lies in the polar opposite direction from Cape May. And Vito and Miriam also happen to be visiting the client–who is none other than Vito’s niece, Helena Pryzchntchynzski. Oy. Further jeopardizing their journey through Jersey is Jim’s discovery of Babette Bernstein. Her murder launches a connect-the-dots of corpses that ripples dangerously around Mina and Jack. Oh–and the kidnappings, plural–are a little scary, too. If you’re in the mood for funny fiction, a cast of chatty pets, and unsolved murders–read on. 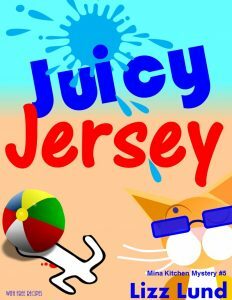 Juicy Jersey packs a roller coaster ride of murders, mayhem and mojitos. Come root for Mina, boo the bad guys and nibble a nosh, courtesy of the author’s recipes in the back of the book, vetted by Lund’s real-life favorite chef, her husband, Chef Andrew. Cape May Point, New Jersey… summer shore traffic… heat waves… and Mojitos. Most of my characters names are based on actual family members. Their personalities… not so much. I wanted to invent a world where everyone is weird in their own way; and tolerant of everyone else's weirdness, too. Except for the murderers. That would be bad. Once again I gently remind you, dear reader—if you don’t like improbable fairy tales; GO BACK. If vintage Steve Martin or Chevy Chase isn’t your thing; please return this book and reclaim your hard-earned cash. We all work hard for our daily bread. Besides which, no one likes to be disappointed, no? That said, if Mel Brooks or I Love Lucy is your thing—you’re golden. I hope you’ll find this book to be one of your funniest reads ever. The reason being simple—the world has gone mad: politicians are crazy; our planet is a crap shoot; and simple-minded teenagers are sprouting into killers. In short—you need a distraction. So did I. This is it. Juicy Jersey is the fifth in the series, but fear not if this is your first Mina Kitchen tale; I made sure you’re introduced to the gang. Well, at least some of them, this time around. After all, we’re not in Lancaster anymore. In point of fact, this is the first Mina Kitchen novel that is not set in Lancaster. James Michener, move over. Well, not really. But seriously—I got him and his team beat when it comes to Bumville. The story you are about to read is completely fictitious. All of the characters, groups and events were spun from daydreams and too many cookies. Any similarities to actual people are completely coincidental. Some of the geographic locations referenced are actual places. Others are completely make believe. For the purposes of this story, all persons and groups herein are made up from pixie dust. The recipes at the conclusion of this book are my own, assisted with critical guidance from my husband, Chef Andrew. If you’re inclined to make them, I hope they will bring a smile to your face as you recall the portions of the story which inspired them. Now it’s time to put your feet up, sit back and relax–who doesn’t love a day at the beach? Jack slammed the suitcases around in the back of the station wagon, re-shuffling the cooler with a grunt for the umpteenth time. Jack rocketed up out of way back, whacking his head against the door in the process. The driveway light next door came on. Across the street, another neighbor’s living room lights streamed brightly through the windows. It’s true what they say about townhouses–they hold no secrets. Especially the driveways. Dawn’s early light now highlighted a flotilla of thin-lipped looks and terse mutterings as we continued loading the car together. We had coasted way past cranky and were blatantly bickering. The past few weeks have not been kind to us. In short: we’ve been stressed. Hi. My name is Mina, and yes it’s pronounced like the bird. Full name; Wilhelmina Kitchen. I’m named after my great-grandmother, who contributed to my genetic cesspool by bestowing her kitchen addiction upon me. Most people pick up a vice when they get stressed–great-granny and I grab wooden spoons. We stood panting a bit, and I noticed a few more lights flick on across the street. The various curtains twitching at the windows lent a nice, cozy feel to our public meltdown. The stressed, French-spewing boyfriend has worked fourteen-hour days for most of the summer. My own schedule hasn’t been much better, since I landed the full-time job working alongside Jack at Squirrel Run Acres. Chef Jacque, when we’re at work (yes, his mom is French). “Not far. I’ll be right back.” I turned to dash back inside the house. “Whatever.” Seriously, our departure for this vacation couldn’t be any later if we tried. Hector, our mutual boss, booked a last-minute dinner for a hundred and twenty last night. This translated into postponing our vacation until this morning. “I didn’t forget anything! I’m getting my purse!” I zipped inside the house to grab the alleged purse–and dashed upstairs for a quick pass at Google’s translator on my laptop. I’d worked enough hours with Chef Boy-O-Friend to understand his basic French cusses. But if he thought I was going to drive three hours up the turnpike and not know what kind of sandwich he just called me, he had another thing coming. I tapped in my search, and there it was. Well. I filed away the ammunition for a future discussion (while fanning the smoke from my ears) then closed up the house. I stood next to Jack’s car, remoting the garage door closed. Jack sat inside the car, fiddling with the radio as it blared forth static from an AM station. I plodded around to the passenger door: it was locked. I knocked on the window. Jack looked up and unlocked it, still concentrating on his radio tuning. I opened the door, hearing a distant voice occasionally puncture through the crackling din. Like me, Jack’s a Jersey transplant. Also like me, he tends to root for the underdog. In his case, it’s the Yankees. Or any other NYC-area team–he’s a sports junkie. He jogged around the car and lifted up the poles, and I was able to slide down in the seat. I buckled my seat belt as he lowered the rods. I guessed my eyeballs should be thankful he removed the lures from the ends, but I wasn’t feeling very #happy at the present moment. In fact, I was beginning to feel more than a tad dubious about the rest of our week together. We coasted down Mt. Driveway, and headed downtown to pick up Jim, Bauser’s three-legged mutt. Bauser and I once worked for EEJIT, and we’ve been buds ever since. His entrepreneurial endeavors took him out of town last week–leaving his dog’s care to me. But yesterday I got a frantic call saying he couldn’t get home for several days. Our revised road trip will bring us to the home of Helena Pryzchntchynzski. Gesundheit. She’s Bauser’s first official client, so he remains loyal. That, and he has a thing for her–even if she does routinely visit the father of her daughter, who remains in prison. Dad’s a small time wannabe ‘family guy’ who’ll probably stay in the slammer until the kid graduates college. Post-Jim delivery, we’ll hightail it in the polar opposite direction to the Jersey shore. Meh. We weren’t exactly in love with our journey through juicy Jersey, especially since it mandated this morning’s crack-of-dawn departure: but we were determined to not lose another day at the beach. There wasn’t much else we could do–there was nary a soul to pass on the pet-sitting baton. All our other pals were on vacation or spoken for, except for Trixie–and she doesn’t count. Yes, she’s my BFF and a spectacular ER nurse. But we’re not trusting her with any kind of pet care until she graduates from neglecting–and annihilating–houseplants. Jack parked silently, while I chewed my lower lip a little. Maybe this sweetheart vacation was too much, too soon? Especially since my sweetheart was acting like anything but? The past four months had started out great–my new par amour was the epitome of a down-to-earth, even keeled guy. Unless you crossed him in his kitchen. Or, after he works all day without eating a thing, and then collapses on your sofa in a diabetic coma after consuming 6,000 calories in one meal–I was becoming brilliant at whipping up a family-sized Shepherd’s pie for one. “I figured. Me, too. Want to come up?” Can I lie, or what? I nodded, although I figured what he really wanted to do was try and tune in aliens again. Or the Yankees. Same thing. Some folks devour potato chips; Jack swallows sports scores. I went upstairs to collect Jim. Given our driveway squabbling, I was glad to have kept the poor dog peaceably out of the way. I collected the three-legged mutt and gave him a last minute walk before we wedged him in the back seat, strapping him into his doggie harness–no easy feat, believe you me. Straight jackets are easier to untangle. We meandered out of the city until we pulled onto Route 30, and took 222 to the Pennsylvania Turnpike. We drove along in quasi-companionable silence, taking turns to reach around and pat Jim on the head. This leg of our trip might not have been so bad, except that Jim compensated for his missing limb with an over-active bladder. We’d no sooner get back in the car, and he’d begin to whine. Well, at least he gave us fair warning. But the extra delays were definitely grating on our nerves. The last two pit-stops had been cordial but strained. “There’s a space.” I pointed. “I know,” Jack said, driving past it. “How about that one?” We drove past another empty parking space. He gazed at me and tipped his chin toward our passenger strapped in the back seat. I sighed, anticipating the half-mile hike from the perimeter of the parking lot to the rest center. Jack was insistent upon parking as far away from humankind as possible, as a safety precaution for our potentially fugitive cargo. A coffee refill looked like a long haul away. We eventually pulled into a remote space, which was so far away from the facilities I felt sure that only a distant galaxy hovered nearby. We parked in front of a picnic table plopped on a patch of dirt surrounded by burnt out weeds. The only other car nearby was a navy blue PT Cruiser convertible parked a few dozen spaces away. He unbuckled his seat belt, opened the door and stretched from the car. The scent of rotting garbage filled the air. “Phew!” I waved at the fumes, as a fly zoomed straight past me toward Jim. Jim’s jaws open and shut, and that was the end of that. He looked around and pointed to an overflowing garbage pail near the Cruiser. “Someone probably forgot to empty it.” The only other parking lot inhabitant to complain was the Cruiser, and it looked shut tight. I imagined the return of its suburban family with their 2.5 kids, the .5 probably being their own dog. Why else would anyone park way back here? “Oh, take your time.” I smiled sweetly at him. “You consider that a term of endearment?” I wondered about our future couple counseling sessions. Jack leaned over me. “Aren’t you glad to be going on vacation with your favorite boyfriend?” He gave me another quick kiss. After sweltering inside the hellish kitchen this summer, Jack and I finally found some mutual time off for a late night dinner. Unfortunately, we were both exhausted and irritable at the start of our date, and tripped headlong into a heated discussion that revolved around the true definition of al dente. Jack punctuated his particular point by lobbing a wad of linguini against my kitchen wall. After a day–or two–of stormy silence, Jack tossed most of his overtime pay at a condo on Cape May Point as an act of contrition. I accepted his apology and conceded my own venomous points by buying him a fancy case of craft beer–to replace his bottles that I’d smashed inside the garbage pail shortly after the linguini lobbing and his stormy departure. But the proverbial carrot worked–we slowly but surely felt the work-strain rippling away from us in small waves as we neared our vacation week. We could all but taste the salt in the air as we ticked off the last days of work. And now, we were finally on our way. “Just the usual, I guess.” Interpretation: a cup o’Joe ‘regular’, as we commuters used to say going in and out of the Big Apple. He left to join the crowd shuffling toward the rest center, as I got ready to walk Jim–again. “C’mon, boy. Here we go.” I dug around in the door pocket and pulled out the lead and a new doodie bag, just in case. Jim thumped his tail expectantly in the back seat, and gave a little bark. I clipped the leash on him, and walked him along the parking lot curb. He sniffed around at the wide strip of dirt and weeds–mostly dirt now, since the summer drought started last May. Apparently, it extended up here, too. Now, in the dog days of August, here I was, another day, another doggie. Don’t get me wrong, I like Jim–but I was looking forward to the end of my tour of dog park duty. Jim inspected every square inch of the curb until we reached the last row of the parking lot, where he finally found a heat-seared shrub to his liking. It wasn’t even eight o’clock in the morning, and already I was clammy and sticky–it felt like ninety. I didn’t have a tissue, so I dabbed my forehead carefully with the hem of my crisp, white sleeveless blouse, while Jim emptied his usual tank. As we turned to head back toward the car, I shoved the clean bag back in the pocket of my new khaki capris–that is, new to me, courtesy of Goodwill. I’m still climbing out from the specter of my unemployment. And what the heck? The tag on them screamed new–they’d never been worn. For six bucks? Jackpot! Normally, for a road trip like this, I would have thrown on sweat shorts and a t-shirt. But this was my first vacation with Jack, right? One of many? I wanted to dress to impress. That is to say: I wanted to look like I floated off a magazine cover and landed, calm, cool and crisp in Jack’s lap. And I thought my dangly turquoise bangle necklace was a fun touch. Although, during our pre-dawn snarling over the car packing, I could have worn a potato sack over my head for all the good it did me. I turned Jim around and took a deep breath–it had been a lo-oong summer and Jack and I were both beat. But soon we’d be sitting on our own porch near the ocean, holding ice-cold beers, and chuckling about how we’d wound our knickers in a twist this morning over nothing, no? Jim yanked me toward the table, more precisely, toward Jack, who sat with two large Styrofoam cups in front of him and a paper sack that looked suspiciously like baked goods. Jim reached the table first (of course) and threatened to topple the coffees–and more importantly, the pastries–onto the ground for his benefit. I dug around in my other pocket, which still held his doggie treats from the last pit stop. Jim begged to differ by attempting to sit-pretty for a treat and fell over. But this wasn’t unusual; missing a limb has its gravitational disadvantages. Jack picked him up and handed him the biscuit. Jim chomped happily. He held out a coffee to me and nodded toward the seat opposite him at the picnic table. I took his hand, looking out at the parking lot, which by now was becoming a sea of pressure-cooker-type tin-can vehicles, releasing the inhabitants of their own cranky caravans. Children cried, wives yelped directions and husbands grunted and snapped. Maybe there was a recent lunar eclipse? Clearly, the chef beau and I were not the only ones locking horns over stupid stuff. I lifted the lid to my coffee, and took in the decadent aroma of some kind of caramel-vanilla -cinnamon-chocolate-cream coffee–that is to say, a highly-flavored coffee comprised of mostly corn syrup, sugar and dairy-stuff that had never been near a cow. Jack hates flavored coffee, of any kind. Or creamer. He takes it neat, like his occasional whiskey. I, however, love my hazelnut coffee beans. We’ve had a few skirmishes over the morning java; that is, on the few mornings we’ve been able to have together this summer. Still, the peace offering of a highly flavored faux-dairy drink was not lost on me. Mrs. Slash is a recent addition, still to be determined. That is, since we’ve now determined her true gender. She began her foster with me as Mr. Slash, until Vinnie, my mountain lion sized tabby, made us aware he considers the fluffy Siamese quite the femme fatale. Their relationship maintains a steady Mexican stand-off: Vinnie loves her; she hates him. C’est la vie. Luckily, Auntie quickly agreed to pet sit my menagerie–which also includes Marie, my star-struck cockatiel who loves to tap dance to Hollywood musicals. Auntie loves pets almost as much as I do. More to the point, she really loves the idea of Jack taking me on what she considers a pre-honeymoon. She’s been married several times, and is beginning to get a bit sulky about my coming late to the game. “Wouldn’t you like to know?” He grinned and started to pull it away. “Oh, no you don’t.” I grabbed the goodies and peeked. “Oh, you are a good boy! You treated all three of us!” I pulled out the napkins and set forth two proper cheese and cherry Danishes for me and Jack, and a plain nothing bagel for Jim. “Here you go, boy! Jim?” I looked down, and Jim was nowhere to be found. He’d even left half his doggie treat–unheard of. “Jim?” Jack looked under the table around his feet. A horn blared from the crowd of cars. Kids’ voices carried over to us. We looked at each other: if Jim’s was in his usual MO, he’d be loping toward the kids–and their various handouts–but also toward the entrance and exit ramps onto the highway. And the gas station. And a few hundred motoring tourists that weren’t expecting to run into a three-legged dog in the middle of a gigantic parking lot. “I’m not panicking. JIM! JIM! JIIIMM!! !” Which was when I began to run around like an idiot checking our immediate parking spot, including under the car. Then I heard a kid’s voice yelp, “Doggie!” and I was off like a shot toward the main stream of parked cars and feuding families, hoping Bauser’s dog had stopped to grab some kid’s ice cream cone. I ran around the lot like a nut, screaming for Jim, with various families tut-tutting and/or pretending to help me in my search. Families came and went. Finally, distraught–and completely soaked with sweat–I went back to Jack, hoping I was just over reacting as usual, lately. “Not to mention tough for Jim. What if he reaches the turnpike?” I tried not to cry. Jack had a point about that. Vito’s my neighbor–currently an escapee from a witness protection program, although he still kept the moniker, Vito Spaghetti. In real life, he’s Helena Pryzchntchynzski’s uncle, Vladimir Pryzchntchynzski. And yes, they’re ‘family’. Also, in real life he’s maintained a steady cleaning addiction regarding Swiffers and my floors. Weird? Yes, but me and my pet-fluffed floors gleam thankfully. Not like we’d have a choice; Vito knows where my spare hidey key’s kept and lets himself in on a regular basis. But complicating matters was that Vito and his main squeeze, Miriam, left to visit Helena and her baby a few days prior to Bauser and Norman’s last-minute service call. I was kind of dreading the out-of-state homecoming to begin with–never mind arriving without Jim. Jack turned me around and hugged me. I leaned my head onto his chest and took a deep breath, trying to fend off a wave of tears as I glanced over his shoulder and into the now-empty back seat. The empty harness choked me up, and I put my head back on Jack’s chest. He pointed toward the PT convertible. Suddenly, we heard growling. Then, we watched in horror as Jim began tugging at the roof of the convertible, tearing away a good section of the navy blue rag top in his mouth. We sprinted toward the car, but too late. I know Bauser said Jim’s mostly mutt, but did he have to have hybrid jaw-chomping genes? (Bulldog? Newfoundland? Hound of the Baskervilles?) The rag top was now literally in rags. We found Jim deep inside the back seat, pawing away for all he was worth. What kind of snacks did this family hoard? Jim had not only ignored his Treatsy Wheatsies but a fresh (okay, probably day old) bagel for Pete’s sakes. And that was when Jack reached in, unlocked the door and pulled it open to yank Jim out. Jack tugged at Jim’s leash, as Jim in turn tugged at a blonde inside the trunk, via the flip-down back seat. A very dead blonde. Apparently, the garbage pail wasn’t the only thing fermenting in the August heat. The cloud of flies descending around us highlighted that icky factoid. Jack explained the blonde’s dilemma to the nice emergency dispatcher, while we rushed away from the stench and bugs. I eavesdropped. Yeah, I guess we couldn’t just leave a dead body where my buddy’s dog found it. Even if there were mostly slobber marks at the scene. I sighed, anticipating more ‘discussions’ to further hijack our vacation. And waiting for the police wasn’t exactly going to speed things up. And the day was growing hotter and stinkier. I was pretty sure hot and stinky weren’t the two main ingredients for a happy vacation. Or, to avoid another heaping helping of cranky. He hung up and looked at me. “Great.” I leaned against a small maple, grateful for some miniscule amount of shade. “Jim? Uh-oh…” We looked away from the scene of the crime, to see Jim creating his own crime scene, happily scarfing down both our Danishes, lapping my coffee (with the fake cream), and completely ignoring the bland bagel bought just for him.